Meanderings: As a kid, my hero was Batman. Never mind that I was a girl – I wanted to be Batman anyway, and my young playmate Michael? Well, he had to be Robin, because I would not allow it any other way. As I got older, my heroes became Albert Einstein, Ronald Reagan, Sandra Day O’Connor and Maggie Thatcher (yes, I did stand in the rain for an hour to meet her for a book signing of, The Downing Street Years). I grew up with the popular culture machine forming my ideas of what a hero was. It only started to change when I met people in my life that had really sacrificed and paid a personal price for others. I met James Brady, who took a bullet to the head to protect his President. I got to know a Marine who served 7 tours in the Mideast fighting for his country. I knew a physician, father, Army officer who agreed to go to Iraq one more time to take care of soldiers, though his service to the Army was over…I met a single mom, who worked for me full-time, went to school at night and raised her daughter by herself…her sacrifice ultimately resulted in her daughter becoming a pediatrician for special needs children. This to me was what a hero looked like, as heroism is that special ability in someone to put the greater good of others before the betterment of themselves. Initiated without the expectation of material gain. The entire Bible is rife with information that either points to Jesus (Old Testament prophecy) or fulfills messianic prophecy (The New Testament). Even though Jesus faced much persecution from the Sadducees and Pharisees (ruling class of the Jews), the Romans, the Gentiles, other Jews and even his own family didn’t believe in Him at one point; He knew His purpose for coming to this Earth was greater than the sum of all of it. Man needs redemption. Jesus has provided it. At the cost of His own life, he became sin for us, he paid the sin price, he defeated death and He offers eternal life to those who will believe in Him. 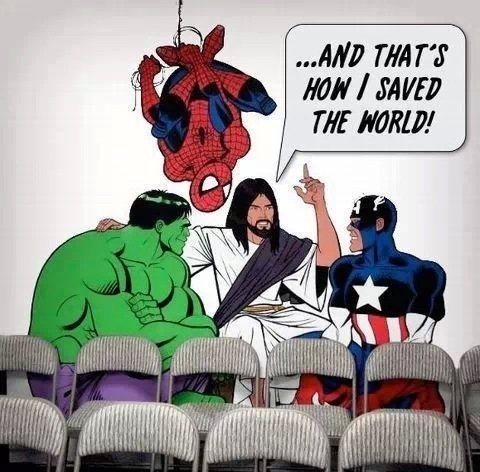 12 Salvation is found in no one else, for there is no other name under heaven given to mankind by which we must be saved.” Acts 4:12 …and because He did this for me, for you, for us all – well, that is a Hero we can all believe in. No need to respond or like! You’ve been wonderful. Just wanted to bless you.